Journal of Foot and Ankle Research (JFAR) was launched in July 2008 as the official research publication of the Society of Chiropodists and Podiatrists (UK) and the Australasian Podiatry Council, replacing both the British Journal of Podiatry and the Australasian Journal of Podiatric Medicine. This editorial celebrates the 10 year anniversary of the journal. Journal of Foot and Ankle Research (JFAR) was launched in July 2008 as the official research publication of the Society of Chiropodists and Podiatrists (UK) and the Australasian Podiatry Council, replacing both the British Journal of Podiatry and the Australasian Journal of Podiatric Medicine . JFAR was developed to meet the growing need for an international platform for the publication of research within the podiatry profession [2–6], and the timing of its launch coincided with the rise of open access publishing – an innovative publication model which enables free full-text access to anyone with an internet connection . Since its inception, JFAR has been published by BioMed Central (now BMC), one of the pioneers of scholarly open access. This editorial celebrates the journal’s 10-year anniversary by summarising the key achievements of the journal between 2008 and 2018. 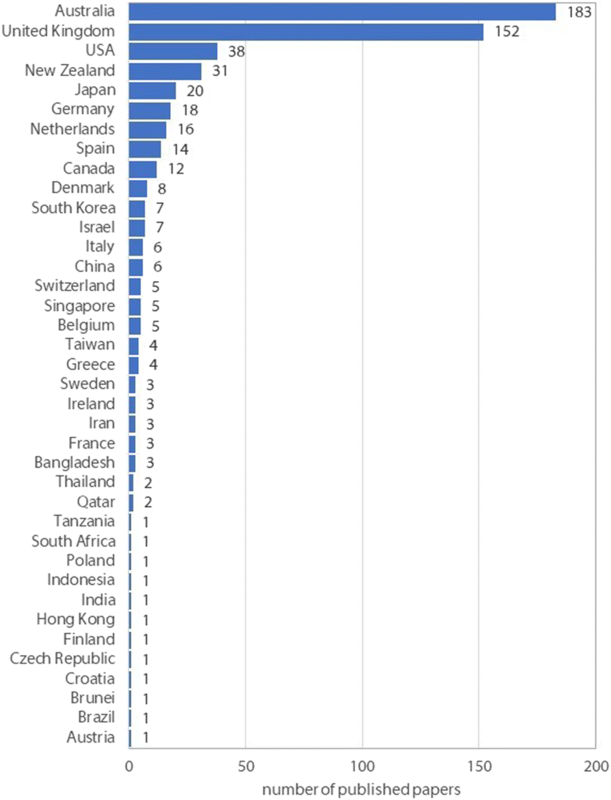 Since July 2008, 442 papers have been published in JFAR, with authors from 38 different countries (see Fig. 1). JFAR has also published 14 conference proceedings, including the biennial Australasian Podiatry Conference (2011, 2013, 2015 and 2017), the annual College of Podiatry conference (2010, 2013, 2014, 2015, 2016 and 2017), and the International Foot and Ankle Biomechanics Community (i-FAB) conference (2008, 2012 and 2014), and five article collections: the Diabetic Foot (2012), the Rheumatoid Foot (2013), the Paediatric Foot (2015) and the Science and Sociology of Footwear (2018). 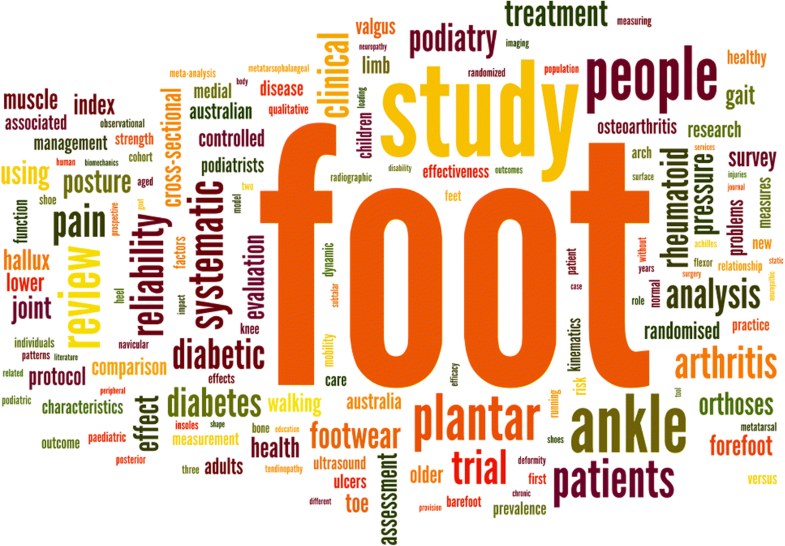 According to the Scopus® database, the ten most common keywords used in the abstracts of JFAR papers (excluding humans, male and female) were foot, physiology, podiatry, gait, ankle, diabetes, shoes, biomechanics, foot orthoses and footwear. A word cloud representing the 150 most common words used in the titles of all 442 papers published in the journal is shown in Fig. 2. JFAR receives between 100 and 150 papers each year, of which approximately 50 are accepted for publication. The acceptance rate is trending downwards and is currently 36%. The average time to a first editorial decision for reviewed manuscripts is 55 days, and the average time from submission to acceptance is 112 days (this includes the time taken to find peer reviewers and the time taken for authors to revise their manuscripts). Over the past 10 years, the time taken to find peer reviewers has increased. This reflects the growing global burden of peer review in the biomedical literature, which has been estimated at 63 million hours per year . To determine the fate of papers rejected from JFAR, we extracted the first 100 rejected papers from the editorial database, and searched PubMed and Google Scholar in April 2018 using the title, key words and author names of each paper. Of these papers, 39 could not be located in another journal. 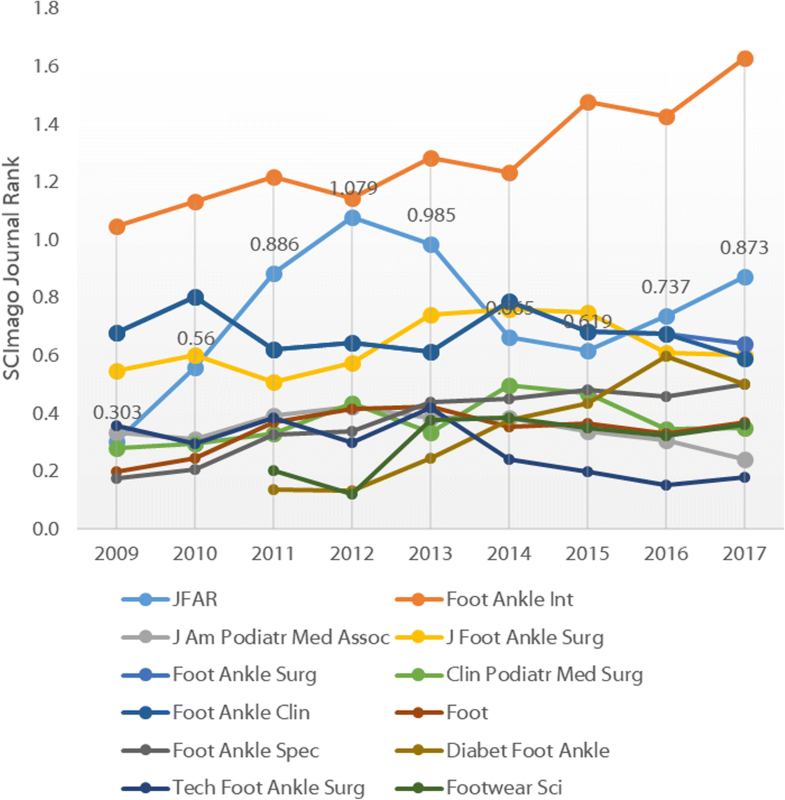 The remaining 61 papers were subsequently published in 45 different journals (including six foot and ankle journals), the most common destination journals being The Foot (seven papers) and Journal of the American Podiatric Medical Association (six papers). The time period between rejection from JFAR and subsequent publication in another journal ranged from 0 to 58 months (median 16). These data provide evidence of a journal hierarchy amongst foot and ankle researchers, with papers eventually published in The Foot, Journal of the American Podiatric Medical Association, Diabetic Foot and Ankle, Foot and Ankle Online Journal, Foot and Ankle Specialist and Foot and Ankle Surgery first being submitted to JFAR. However, it is also likely that JFAR receives manuscripts rejected from other journals, particularly specialist biomechanics, sports medicine, orthopaedics, diabetes and rheumatology journals. There are several citation-based metrics to evaluate journal performance. By far the most widely used is the Impact Factor (IF), first developed in 1955 . The IF represents the average number of citations received per paper published in that journal during the two preceding years (2-year IF) or five preceding years (5-year IF). JFAR was formally accepted for IF tracking by Thomson Reuters (now Clarivate Analytics) in November 2011, and received its first IF (1.333) in 2012 . 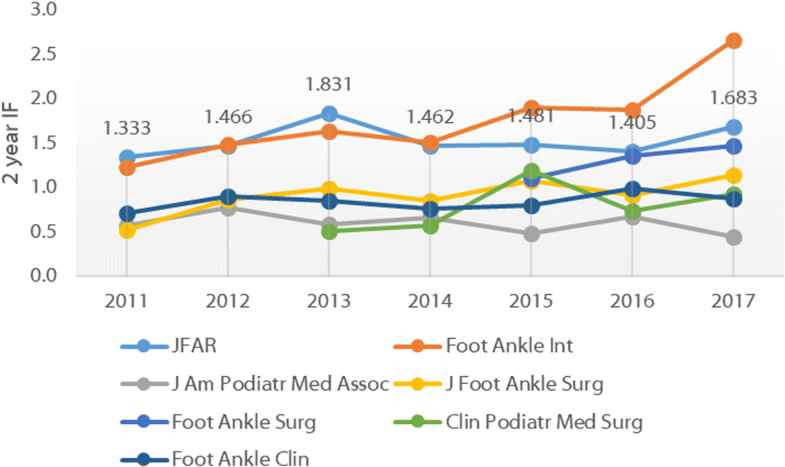 Since this time, the IF has fluctuated (largely as a function of the total number of papers published per year), with the most recent IFs available indicating that JFAR has the 2nd highest 2-year IF (1.683) and 5-year IF (2.187), behind Foot and Ankle International. The 2-year and 5-year IFs for all foot and ankle journals are shown in Figs. 3 and 4, respectively. More recently, the SCImago Journal Rank (SJR) has been developed by the technology company SCImago Lab . The SJR uses Elsevier’s more extensive Scopus® database and uses a more complex algorithm similar to Google’s PageRank which accounts for both the number of citations and the prestige of the journals where the citations came from. JFAR’s SJR (0.873) is second only to Foot and Ankle International (Fig. 5). 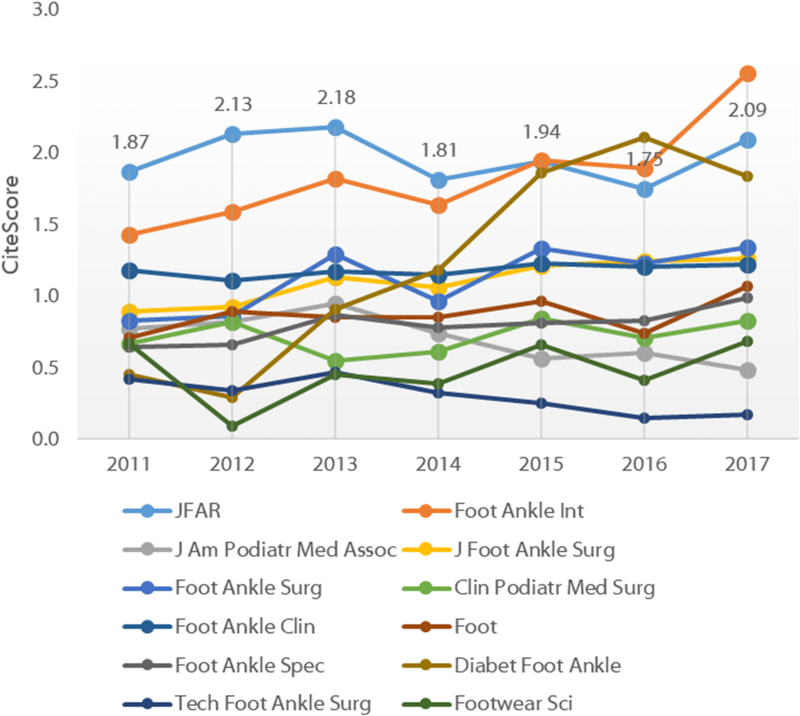 Finally, Elsevier’s new CiteScore metric , which reflects the average citations per document that a title receives over a three-year period and incorporates all document types, shows JFAR (CiteScore 2.09) ranked in 2nd position behind Foot and Ankle International (Fig. 6). These data clearly show that JFAR has performed extremely well for a relatively young journal. However, JFAR’s position on citation metrics, as outlined in our 2012 editorial, remains that “rather than agonising over ubiquitous yet flawed journal performance metrics, we will continue to make editorial decisions based on the relevance and scientific quality of individual manuscripts” . The impact of individual papers can be assessed in several ways: the number of accesses, the number of citations, and the number of mentions on social media. Table 1 shows the top ten papers according to each of these metrics, using data from the JFAR website, the Scopus® database, and Altmetric Attention Scores, respectively. The most accessed manuscript in the 10-year history of the journal is Bristow’s clinical guideline for the recognition of malignant melanoma , the most cited paper is Redmond et al’s normative values for the Foot Posture Index , and the paper with the most social media coverage is Neal et al’s systematic review of foot posture as a risk factor for lower limb overuse injury . Another way to assess the relative importance of papers is by applying the hierarchy of evidence, which places systematic reviews above all other study designs, including randomised trials, non-randomised studies, observational studies, case series studies and case reports. In this context, it is pleasing to note that JFAR has published a total of 31 systematic reviews. These reviews have summarised the best available evidence for a wide range of topic areas, including the effectiveness of treatments such as foot orthoses , stretching , dry needling , laser therapy , prolotherapy , extracorporeal shock-wave therapy  and soft tissue surgery . Systematic reviews are an extremely valuable resource for clinicians trying to keep up to date with the growing body of research literature pertaining to the treatment of foot disorders. The BMC website attracts over 20 million visits each month. In 2017, JFAR’s dedicated site received 264,565 page views, with an average of 19,214 views per month. 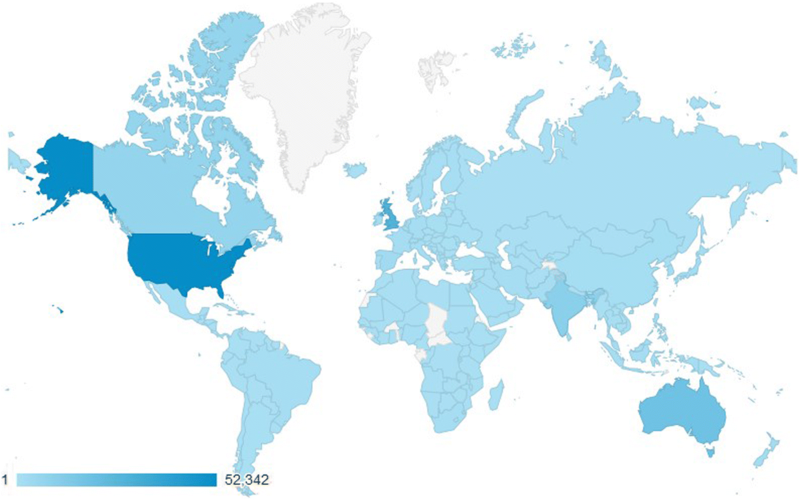 The website was accessed by readers from most countries in the world, with the highest number of accesses from the USA (59,971), followed by the UK (43,733), Australia (31,260), India (12,838) and Canada (8218). See Fig. 7. 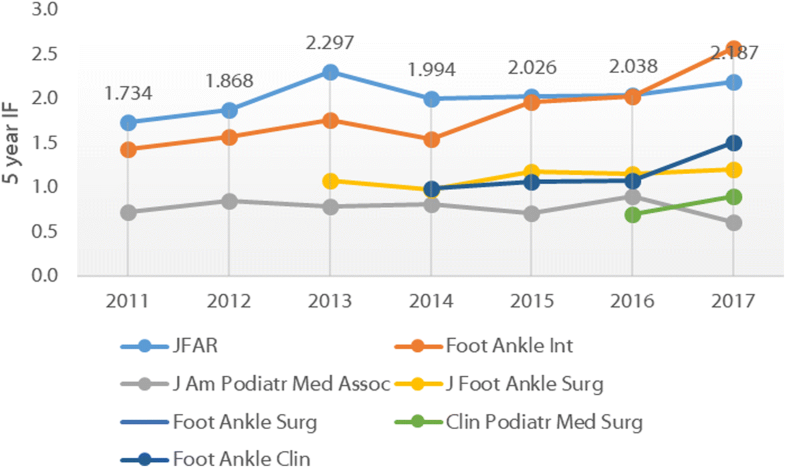 As the first foot and ankle journal to fully embrace open access publishing, JFAR has been an early adopter of innovations in academic publishing. Consistent with BMC’s ethos of transparency, we operate an open peer review process (where authors’ and reviewers’ identities are disclosed), and we publish all peer reviews on our website. The BMC platform also allows for non-traditional content to be uploaded to support manuscripts, including video files  and downloadable 3-dimensional models . Engaging readers, however, particularly time-poor clinicians, is an ongoing challenge for all scholarly journals. Relatively recent innovations to improve readability, engagement and translation include video abstracts  and infographics – brief summaries of research papers that use data visualisation techniques to convey key messages . Several journals have trialed infographics, either to supplement full papers or as stand-alone, peer-reviewed publications. At JFAR, we will explore all strategies for improving the reader experience while ensuring that the information provided is as accurate and unbiased as possible. Professor Hylton Menz (Editor-in-Chief, Australia) and Professor Alan Borthwick, OBE (Editor-in-Chief, UK) will step down from their roles at the end of July 2018. The new Editors-in-Chief will be Professor Keith Rome (AUT University, Auckland, New Zealand) and Professor Catherine Bowen (University of Southampton, UK), the new Deputy Editors will be Dr. Andrew Buldt (La Trobe University, Australia) and Dr. Michelle Spruce (Blandford Forum and Wareham, UK) and the Associate Editors will be Mr Daniel Bonanno (La Trobe University, Australia), Dr Cylie Williams (Monash University, Australia) and Dr Anita Williams (Salford University, UK). The authors would like to sincerely thank the following individuals for contributing to JFAR’s success over the past 10 years: past and present editorial colleagues (Mr Mike Potter, Associate Professor Karl Landorf, Associate Professor Shannon Munteanu, Dr. Farina Hashmi, Professor Joshua Burns, Professor Keith Rome, Dr. Anita Williams, Mr. Daniel Bonanno and Dr. Andrew Buldt), past and present BMC journal development managers (Shivani Gore, Miranda Wilson-Woods and Victoria Slim) and past and present Board of Management members (John Price, Alison Petchell, Graham Ramsey, Dr. Sue Whicker, Kelli Cheales, Dr. Anita Raspovic, Damien Mitsch, George Wilson and Nello Marino from the Australian Podiatry Association, Joanna Brown, Rosemary Gillespie, Clare Richards and Paul Chadwick from the College of Podiatry/Society of Chiropodists and Podiatrists, and Stephen Hartman from the Canadian Federation of Podiatric Medicine). We would also like to thank our editorial board and peer reviewers for their tireless efforts in assessing the suitability of papers for publication. HBM drafted the editorial with assistance from AMB and CJB. All authors have read and approved the final manuscript. SCImago Journal Rank http://www.scimagojr.com. Accessed 1 June 2018. Elsevier CiteScore https://www.scopus.com/sources. Accessed 1 June 2018.